Wonderful facilities, the breakfast was like eating in a restaurant. The staff was so helpful - nice little kitchen, will definitely stay there again. Big bathroom, great towels, cleanliness and really nice pillows! The pool could have been cleaner. 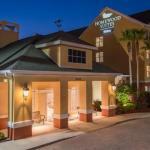 The 90 all-suites Homewood Suites Orlando /UCF Area is located one mile south of the University of Central Florida and is designed for the longer stay business or pleasure traveler. Items included with the room rate are a hot breakfast buffet, a light dinner and cocktails on midweek evenings, high-speed Internet access, local telephone calls, a morning newspaper and parking. There are is one room available for business or social functions that can accommodate 50 guests. The property is 10 miles from downtown Orlando. Area landmarks and attractions include Walt Disney World, SeaWorld, Wet n Wild water park, the Islands of Adventure amusement park, Universal Studios and the CityWalk entertainment complex, the Orlando Convention Center, Sea World, the Florida Citrus Bowl, Amway Arena, home of the Orlando Magic basketball team and shopping at the Prime Outlet Shopping Mall and Fashion Square Mall. The studios and one-bedroom suites have separate living and sleeping areas. Each has a fully-equipped kitchen with full-size refrigerator, microwave oven, two-burner stove, dishwasher and tea and coffee making facilities. Other amenities include two remote control televisions with news and cable channels, high speed Internet access, two telephones with voicemail, an iron and ironing board and a hairdryer. This hotel has an outdoor swimming pool, tennis and basketball courts and a fitness center. Restaurants nearby include a Longhorn Steakhouse, TGI Fridays, Tony Romas barbecue, Don Pablos and the Hops Brewery. The 24-hour front desk has safe deposit boxes and information on the Orlando attractions and events. Other amenities include a coin-operated laundry, video arcade, business center, a convenience store and gift shop and ice and vending machines. Travelers who have stayed at this hotel rate it highly. The suites are well equipped, clean and comfortable. The complimentary breakfast is far better than many expected and the employees are prompt and polite. The location close to the University of Central Florida is ideal for family or friends visiting students at that facility. The only minor gripe was that there were only a limited number of television channels available. Despite this most guests said they would stay at this hotel again and recommend the property to others.